Ice Cream for your DOG?! Yes! Speaking of treats that are GOOD for your dog, how about some ice cream?! Yes, ice cream for your dogs! “Frosty Paws” (in your grocer’s freezer, right next to your favorite frozen treats) has been around for a while; but tend to be pricey for a treat that disappears quickly. Have some ripe bananas, plain yogurt and peanut butter? 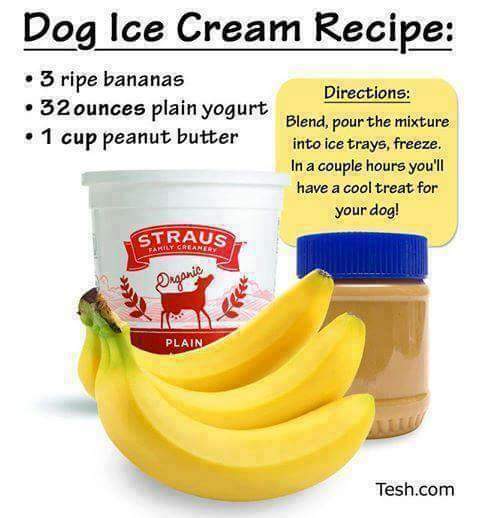 Whip up a cool treat for your dog with your own healthy ingredients! Let us know in the comments below how YOUR dog rated the ice cream … one or two paws up?